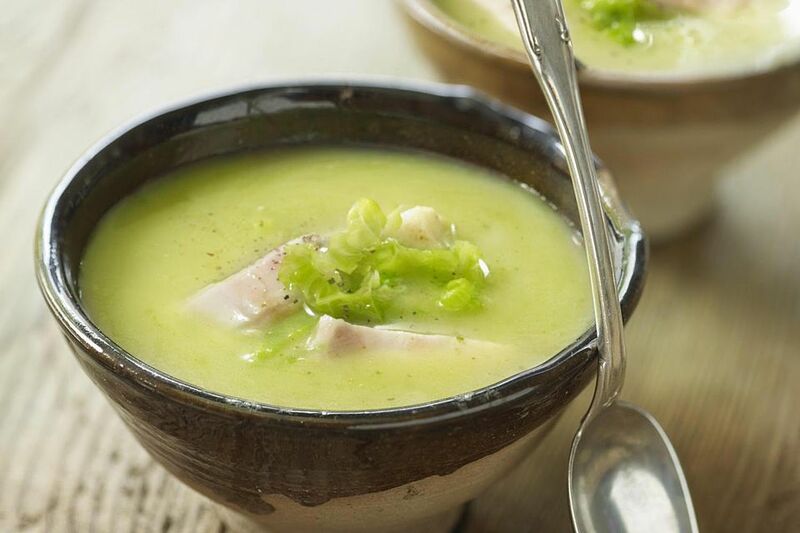 Pea and Ham Soup is a classic winter dish, ideal for warming you up on a chilly day. You simply boil some ham bones or a small ​hock with dried green peas, a few vegetables, and herbs -- it's that easy! Pea and Ham Soup is hearty, delicious, and inexpensive, making it a popular choice for people on a budget. Serve this soup with sour dough bread and good butter for a simple but filling meal or as the first course for a more elaborate meal. Pea and Ham soup keeps well in the fridge for three to four days. It will thicken significantly over time so simply add extra water and mix thoroughly to combine each time you reheat it. Wash dried peas, discarding any grit or odd looking peas. Place water, peas and hock into a large pot. Add bay leaf, onion, carrot stick, celery, and garlic. Bring to boil then turn down to simmer for 90 minutes. Skim off the scum that rises to the surface every 20 minutes and discard. Top up soup with an extra half cup of water if desired. Taste soup and add salt and pepper as desired before serving. You can't really overcook this dish so don't worry too much about the cooking times. Simply add extra water if the soup is looking too thick. The ham will add a lot of flavor to the soup so you'll probably find you need less salt than normal. Try half a teaspoon first and taste before adding more. You may wish to blend the soup slightly using an immersion or stick blender -- remove meat and bones first -- for a smoother texture. If you don't want to blend the soup you may wish to remove the carrot and celery before serving.